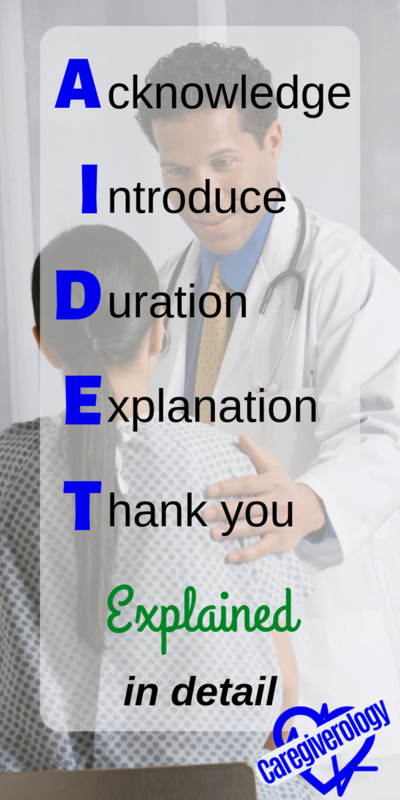 AIDET is an acronym for acknowledge, introduce, duration, explanation, and thank you. It is used in many healthcare facilities as a foundation for effectively communicating with their patients. It can be useful during bedside shift report. It was created by the Studer Group. Each step doesn't necessarily have to be done in an exact order and should feel natural. If your patient can tell you are speaking in a step by step fashion, it will make the conversation feel forced and not as therapeutic. Always be as real and genuine as possible. You acknowledge the patient by name, or sir/ma'am if you don't know it, when you greet them. Calling them by name is an easy way to start making a positive impression. You typically refer to them with their last name, unless they have said they prefer another name to be used such as their first name or a nickname. Some healthcare workers will just barge in a patient's room unannounced and start doing whatever they are there to do. Don't be one of these. Make sure you acknowledge that there is another person in the room, even if you are with waste management and are just taking out the trash. While the patient is there, that is their own personal room and should be treated as if you were a guest walking into their own home. This also includes knocking before entering. Tell them "good morning/afternoon/evening" depending on the time of day. Even if they aren't in the best circumstances at the moment, this is still a great way to make a kind impression. Smiling is a must. Give off a friendly vibe that lets the patient know they are safe and that they are not a bother to you. They should feel you are happy to take care of them, even if you aren't. You introduce yourself to them by stating your name and title. You can get more specific, such as your specialty or how long you have been in the field, as long as it gives off a positive impression. Don't brag, but show you are confident. It's comforting to the patient when they know who you are and what your purpose is before you begin to care for them. You wouldn't want someone touching you if you didn't know who they were. Patients feel the same way. It's a good idea to remind your patients who you are even if you've taken care of them before. Even if you remember them, they may have forgotten you, especially if they have dementia. I've known some patients who have told me someone came in their room and did something but they don't know who they were. This shouldn't happen. They need to be aware of everyone who comes in and out. Even if you are just checking a bed alarm that is alarming on a unit that you are visiting, you should let that patient know who you are. It only takes a second. Tell the patient the duration, or how long, things are going to take. If you are only introducing yourself, you can tell them when you will be back and how much time you have left on your shift. If they are calling for assistance but you aren't able to help them immediately, either you or another employee should let them know how long they have to wait before you can assist them. If they have a procedure that is about to be done, tell them ahead of time approximately when that procedure is expected to begin. This helps prepare them for what's to come which also helps them be more compliant with their care. The patient may ask things such as "How long until the doctor shows up?" or "When does breakfast arrive?" Always answer these to the best of your ability. Simply saying "I don't know" is unacceptable. If you truly don't know when something is going to happen, try to find out as soon as possible and follow up with them. Explain what you are doing for them at that moment, even if it's just telling them you are introducing yourself or getting shift report. Give a run down of what the plan for the patient is during your shift and keep them informed if plans change. If plans are likely to change, make sure they know so they feel informed and can prepare themselves. Make sure you are using terms they understand. We become immune to the caregiver language and will often use medical abbreviations that they aren't familiar with. It is okay to ask them if they understand what you are telling them. In some cases, it is encouraged to have them repeat back what was said to confirm they are on the same page. They will feel much more comfortable when they have an idea of what something entails, even if it is something unpleasant. If something is going to cause pain or discomfort, they have the right to know. You can even describe what you are doing step by step while you do it so nothing is left unexplained. This is especially useful with things that take awhile such as dressing changes. It can break up the silence. There is nothing more frightening than being in an unfamiliar place with unfamiliar people and not knowing what is going to happen next. You can be the one to help ease their anxiety. Thank your patient for allowing you to take care of them. This is especially effective if you are about to end your shift. It leaves a lasting impression that shows them you were happy to care for them. Thank them for choosing the facility or service that you work for. Even if they didn't have much of a choice in the matter, this shows that you are a proud employee which makes them feel they should be proud to be there. Even when they aren't being particularly patient, you should apologize and tell them "thank you for your patience" when things don't get done in a timely manner. Patients may do things for you such as complimenting your work ethic. Some facilities even have forms patients can fill out to have a record of their satisfaction. Always show your appreciation for such things. Thanking your patients should be genuine. Without them, we have no career. We should all be thankful when we are given the opportunity to help others and make the world a better place.